It was the middle of the afternoon at Gloria's in Addison, Texas. I was with some friends and my boyfriend enjoying a margarita swirl and chips and bean dip. I had no idea what the swirl margarita consisted of, but I do know after four sips, I was drunk. That's when I started passionately talking about Gwen Stefani. "You have to give Gwen cwedit, though." Everyone put their heads in their hands and knew I was done for. My day was over. I was drunk. Four sips of Gloria's had won and I had lost. But if you thought it couldn't get any worse from pronouncing credit like a thick-tongued 3-year-old, just you fking wait. Somehow mugshots got brought up. Somehow Tim Allen's mugshot got brought up. 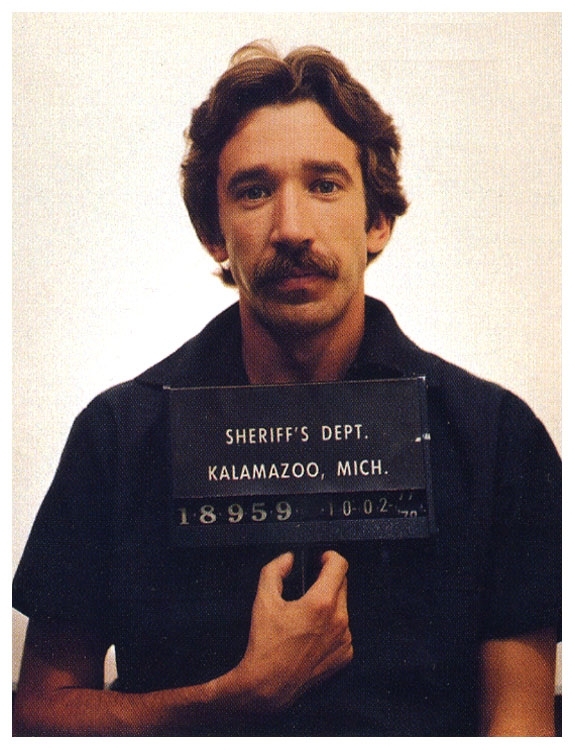 Somehow I googled Tim Allen's mugshot. Somehow I saved the picture on my phone. Somehow I made it my phone background. Somehow I'm alive today. I remember my friend Cayla telling us that mugshot used to be her Myspace background. In my drunken state, I thought that was chic as hell for some reason. I don't know why. I'm embarrassed. I don't know what's in Gloria's margaritas, but thanks to them, Tim Allen's 1978 mugshot with a mustache is now my phone background. You can't possibly hate me more than I hate myself.